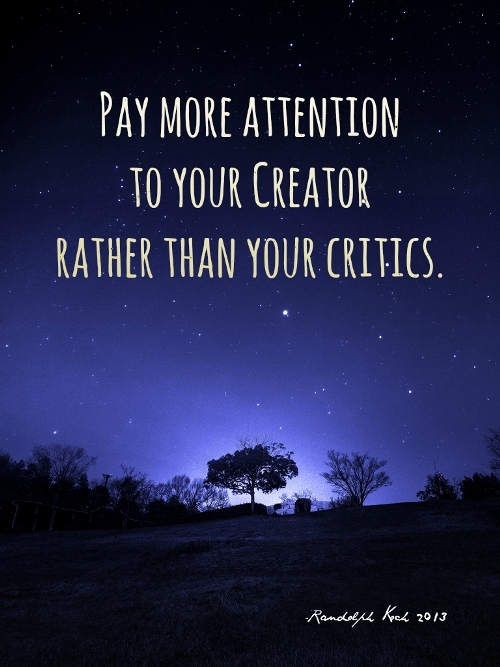 "Pay more attention to your Creator rather than your critics." I've been learning this lesson and sometimes the hard way over the years and I strive all the more today to pay attention to my loving Heavenly Father rather than others. Why? Because if I let my guard down and lose my focus on Him - I end up exhausted trying to live for the approval of others or by trying to make people like me or gain their approval which is futile! Many times I’ve lived to try and please, gain the approval of, or get people to like me who honestly will never give it to me nor do they honestly give me much thought at all. To meld my words with the words of I’m sure of many others, let me share that it really comes down to focus - putting your focus on The Lord your God rather than just other people's opinions of or actions toward you! This doesn't mean that we can't learn from our critics but it does mean that some people, no matter what you do, that they are never going to be for you! I know it’s a tough truth but it’s the truth! One that I’ve struggled with a lot at times – especially when people you expect to be supportive of and an encouragement to you only to find they aren’t and have no intentions to be for various reasons like their own insecurities or jealousy to name just a few. Think about it, you could exert a lot of effort, (and probably do sometimes, right?!) trying to work hard to change yourself and try to meet all their, (many times unhealthy) demands and attempt to do everything they asked, yet, they still find something wrong. Plus, they never change anything about themselves but they demand change of you! We need to continually learn to ignore those critical voices. Ask yourself, why do I need those people’s approval? Why am I knocking myself out to meet their approval?! Let me tell you, the truth is - you don’t need their approval! I wonder sometimes if this isn’t part of why He gave us His armor to put on, (which is primarily for the spiritual battles we face See Ephesians 6) maybe also to help us battle against the negative voices that come our way deflecting the flaming arrows of those critical voices in our lives as well which has spiritual impact on us! Stop for a moment and take inventory of especially your friends, how many of them are truly there when you really need them? How many of them are there only typically when you are doing something for them? How many people came to mind that are always negative or judgmental toward you and rarely supportive? Give it some thought. Maybe for the list of those who aren’t truly there for you, it’s time to remove the negative voices/people from your life, even for a season? Why, because they are hindering your walk with God and negatively impacting your self-worth as well as adding stress to your life that you don’t need!! It’s not that your life will be perfect, EVER, but it is about the inputs you have in your life whether bad or good and again about the focus you should have…if your focus is fogged-up, it’s time for some “de-fogging” for your own good! :-) You may feel selfish about it at first but that’s because you’re used to craving approval and doing for those who just take and give nothing in return. God wants to fully use you and if your focus is off – He cannot fully use you or form you further into His image! Next, take inventory of those who are truly there for you when you need them and with no strings attached – the ones that are always there to speak truth in love into your life? Those who aren’t constantly judging you or causing you pain. The ones who care about and love you unconditionally? Besides your Father in Heaven who is always there for you, who here on earth is really there for you? Maybe it’s time to put your energy into those relationships again, for your good! The reality is that you weren’t put on earth to be a people pleaser or to bow to everyone’s whim. If you do that you’ll just end up being used up by people that try to manipulate you or try to over-exert their perceived power over you and miss the blessing of being utilized by the One who truly loves you and cares for you! …and miss the important relationships that are right there in front of you but you’re so caught up in “the fog” - the negativity that your experiencing that you’re blind to this!? • keep your focus on God your Father! • stay in His Word and learn about Him, yourself and how He wants you to live! • be about the Father’s business and to do His will! • stay focused on your future! 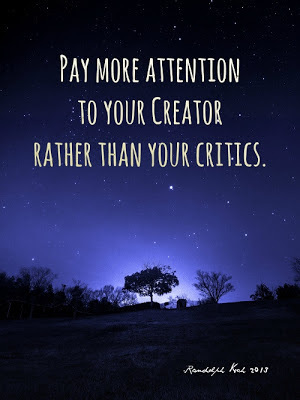 • allow His truth to permeate your soul and allow His Holy Spirit to strengthen you to ignore the critics and move forward into the life of blessing He has prepared for you! God is for you! He wants all of you! So, let’s pray for each other that we will break free from the destructive patterns and people we’ve had or currently have in our lives so we can be more about the Father’s business and the positive influences in our lives. Another thought for you to consider is, who’s always there for you yet you sometimes only pay attention to their friendship when they are doing exactly what you want them to do or going with you to only exactly where you want to go? Are you only thinking about yourself and what you want and not considering them in your plans when you get together? Are you maybe doing to them exactly what you don't like that others do to you? You should change this starting today, or you may lose them - a person who is a positive influence in your life!